Where Are My Unnumbered Days? I seem to have turned a corner compositionally in 2016/17 – suddenly things I write sound almost *exactly* the way I want them to once I’ve finished them, instead of mostly or kind of the way I want them to. Here’s a selection of pieces written in the last year or so – I hope you’ll agree. My #choirsagainstracism project has been essential to this – having something that I’m passionately angry about has been a massive creative force – and all the pieces written through that are free, so why not try them with your choir? Voces Inauditae in Edinburgh will also be singing it (SSAATTBB version) in September. “The Beach”, the final piece from the same set, will be workshopped by the BBC Singers in October – recording coming soon hopefully… would your choir like to premiere it? Available for SSSSAAAA or SSAATTBB – get the score at #choirsagainstracism. 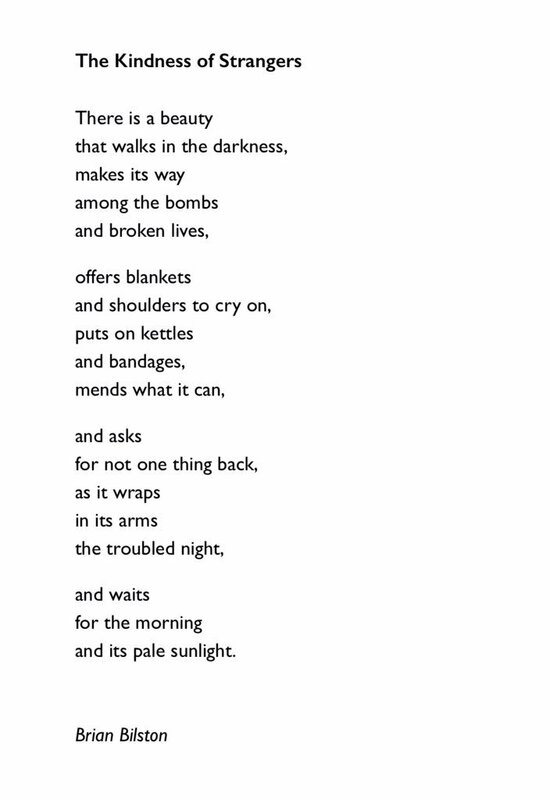 Also unpremiered so far: Brian Bilston, the unofficial poet laureate of Twitter, has very kindly allowed me to set his poem “The Kindness of Strangers” to music. It’s written in memory of the bombings in London and Manchester (and set to music also with the tragedy at Grenfell in mind). It’s about 3 minutes long, for SATB (maximum divisi to SSAATBB, ideal if you’re a bit short on tenors), easy to medium difficulty. New! A New Year Carol – SATB with a few bars of soprano divisi. Would make a good closer or encore for a concert near Christmas, or (ideally!) for a concert around the start of the year. Download the score and hear an audio demo. £20 for a PDF to print unlimited copies, or £1 per printed copy (plus postage if outside the UK). I’m also rather pleased with how “Incitement to Sailing”, the first part of “The Birlinn” to be completed, has come out – it’s available for SATB and piano or for TBarB and piano. Premiere of SATB version coming November 2017. Janya – rescored for full orchestra – needs a fairly big orchestra (3-3-3-2 winds, 4-3-3-1 brass, perc, timp, strings). Versions for SABar and SSA are also available at #choirsagainstracism: ATB version on request. “I Was Listening To A Pogrom” still needs a good recording – for singer(s), piano, and speaking voice(s), words by Michael Rosen (Children’s Poet Laureate). Again, score at #choirsagainstracism. I hope some of these will suit your choir (there are pieces for all sorts of choirs here, from unison beginners to 8-part advanced) – please get in touch at chris@hutchingsmusic.co.uk if you’re interested in performing any of them, or commissioning a new work. Chris Hutchings is a composer, conductor, tutor and singer based in Edinburgh; his works have been performed around the world and won several prizes (in 2019, he has so far won competitions run by the Wicker Park Singers of Chicago and the Murau International Music Festival in Austria). He has received commissions from several choirs in the USA and UK, with pieces performed in 2018 by the Edinburgh Singers, the BBC Singers, the choir of Chicago Temple, the Reid Consort, Harmonia Sacra and many amateur choirs. New commission enquiries always welcome. Many of Chris' pieces are available through MusicSpoke. Liturgical – Mass settings etc.